The Giant Panda (Ailuropoda melanoleuca) is known by a couple of names including simply Panda, Great Panda, and Panda Bear. It is a bear that is famous for its love of bamboo, and native to selected mountain ranges located in southwestern China. Diet: Bamboo (99% Their Diet). Occasionally Grass, Rodents & Birds. Predators: Few Predators. Snow Leopards or Jackalls can kill a panda cub. Giant panda typically inhabit regions that are high in elevation, between 4,000 and 11,500 feet. Pandas prefer living in damp, misty forested areas. Giant pandas have specific needs and they include having at least two species of bamboo and a water source contained within an old-growth conifer forest. This type of forest offers large tree stumps and hollow logs that are the right size for panda dens. The other benefits to this type of habitat are that shelter and nutrients are present for the bamboo that grows there. The giant panda was once widespread throughout China, and even Myanmar and northern Vietnam. However, they have been on the endangered species list from 1990 to 2016, before this was switched to vulnerable – mainly due to habitat loss, poaching and poor breeding. The giant panda can now only be found in 20 isolated patches of bamboo forest in six mountain ranges in China’s Sichuan, Shaanxi and Gansu provinces, with most in the Minshan and Qinling mountains. 1. 99% of a giant pandas diet is bamboo, and they will consume 20kg of it each day. 2. Giant pandas do not weigh much, even after eating so much bamboo. The male panda is the heavier of the genders, weighing it at somewhere between 75 and 135 kilograms. Females, on the other hand, weigh between 70 and 100 kilograms. 3. Giant pandas have evolved a unique opposable ‘thumb’, which they use to hold bamboo stalks. This ‘thumb’ is actually a enlarged and modified wrist bone, which is also present (in ‘original form) in racoon, red panda, and black bear. 4. Giant pandas have teeth of a carnivore, but are herbivores. Pandas are thought to have evolved from eating animals and plants, to an almost exclusive bamboo diet about 2 million years ago. 5. Giant panda guts are not suited to bamboo. 6. The male panda has a larger range than that of the female. Panda home ranges cover roughly five square kilometers. The male range is on the upper end of that with females holding a slightly smaller territory. 7. All giant pandas in the world are Chinese citizens. As the giant panda is a Chinese national treasure and protected by law, if you see one in a reserve or zoo somewhere else in the world that panda is actually on loan from China. The arrangement is a little more complicated than that as each time a cub is born, it has to be sent back to China in order to assist in expanding the giant panda gene pool. 8. China rents giant pandas to American Zoos for $1m per year. 9. Giant panda populations are not high, but they are increasing. In the 1970’s there were only about 1,000 pandas on the planet. A census taken in 2014 showed that figure had increased to 1,864 pandas living in the wild. 10. The Chinese government is improving nature reserves to help secure their survival. 11. Giant pandas can climb trees and can swim. Giant pandas can climb from around 6-months old, and like all bears, can swim rather well when required. 12. Pandas can live almost twice as long in captivity than in the wild. The average life span of a panda is between 14 and 20 years. That figure jumps to 30 years for those living in captivity. 13. Giant pandas are ‘lazy’. 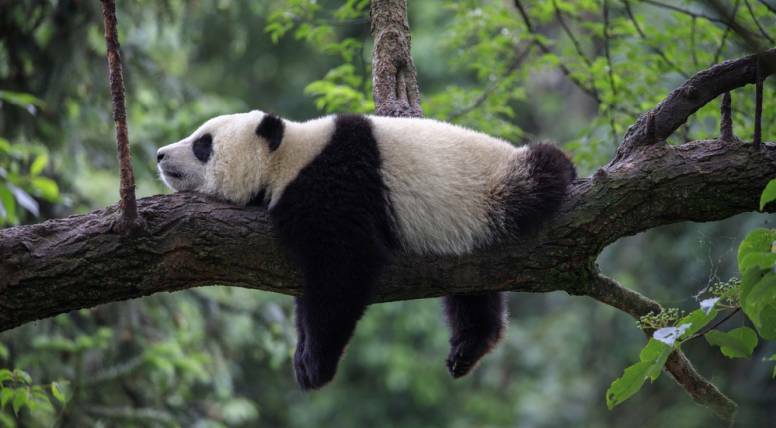 Pandas spend most of their time either eating, or sleeping. Breeding is seemingly not high on their list of priorities. 14. The reproductive cycle for pandas is a tad on the slow side. Mature females will breed once every two or three years in the wild. She will have around 5 litters in her lifetime. 15. Giant pandas have been with us for a very, very long time. Panda fossils have been found that date back between 2 and 3 million years. 16. The meaning of the panda scientific name pretty much describes the creature. Ailuropoda melanoleuca translates to mean “black and white cat foot” and that sort of paints a picture for you of what a panda may appear as if you had never seen one before. 17. Giant pandas do not take a winter nap. The giant panda is one of the few species of bear that do not hibernate in winter. Instead, they will move from their high elevation homes to warmer areas in lower elevations in order to continue to enjoy bamboo. 18. Pandas were a mystery to scientists for quite some time. The giant panda was a bit of a puzzle for scientists who were not certain if they were actually a type of raccoon, bear or maybe a distinctly different species of animal altogether. The DNA contained in the cells of the panda unlocked clues that solved the mystery as the genetic code showed scientists that pandas are related to bears. 19. The black market fur trade has a high price on giant panda fur. The illegal trade market a panda fur can fetch between $60,000 and $100,000. 20. Giant pandas start life pink. When first born a panda cub has pink skin, is about 15cm in size, and is covered with a very thin coat of white fur. It also has a long tail, no teeth and its eyes are closed. In a month, that cub will have most of its black spots and its eyes will open in the following couple of weeks. By the time the cub reaches 14 weeks of age, its teeth will start to appear. At this point, both the cub and its mother will use their den less frequently. 21. Panda mothers and cubs stick together – for a while. The cub won’t leave the family unit until it is about a year-and-a-half old. At that time, it will go off on its own and assume a solitary life that typically all pandas live. 22. Pandas make a lot of different noises. These bears do not roar but they are fairly vocal otherwise. In addition to sounds that resemble those of a baby goat or lamb, a panda can growl, bark, huff and honk. 23. The panda has a relatively large repertoire. Researchers have been able to clearly identify a total of 11 different panda calls. They even say that four of them are reserved for when the panda is seeking a mate. 24. The panda is a symbol of peace and friendship in China. Hundreds of years ago in times of war, tribes would raise a flag with a panda on it to stop a battle and call a truce. 25. The panda is a highly recognizable symbol. The World Wildlife Fund chose the panda as their logo because of the peaceful nature of the bear. 26. There was also a hidden reason for the WWF to pick the panda as their logo/brand. The black and white colors of the panda ensured that printing costs would be minimal as there would be no colors required. “Giant Panda 101”, via National Geographic. “A Tale of Two Pandas”, via Utah Genetics. 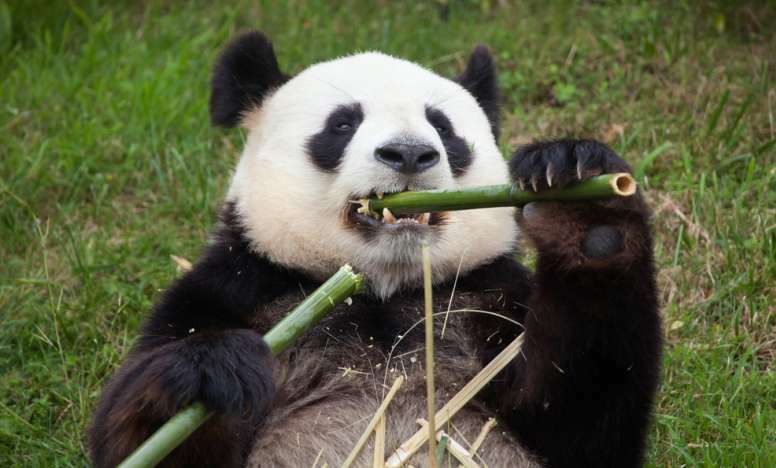 “Giant panda guts not suited to bamboo”, via BBC Earth. “The High Cost of Panda Cuteness” (2016), via Time. “Habitat of the Panda”, via WWF.